TheRustedChain - The Blog: Hey, whatcha doin'? We hear them almost every night, but it's not very often that they just come strolling through the yard in the middle of the day. When The Man got home and I told him he said, "Did you shoot it?!" I proudly said, "YES!" and then grabbed my camera to show him the photos. He rolled his eyes. "I meant with the gun, Beki." Many of you know that I'm not really a country girl. We moved to the country last year. I'm still kind of an imposter. You know how you can tell I'm not from around here? I say kie-yoh-tee. If you're a true country person, this animal is a kie-yoat. 2 syllables, not 3. And it really doesn't matter how you pronounce it, it still doesn't work phonetically with the spelling. And regardless of the weird spelling and pronounciations, I still don't really want them in my yard. How do you pronounce it? 2 syllables or 3? Depends on my mood, but usually 3 syllables. When I lived in my old house (still within the city limits) there was a family of them living in an abandoned house across the street from me. Animal Control didn't seem to be too concerned about it, either. I've seen them out and about during the day before, but not very often. However, I did see 6 deer on my way back from dropping the kids off at school this morning. I wasn't fast enough to shoot them though. I'm kind of a city girls that fantasizes about the country. I think there are some realities I wouldn't be too fond of. I'm a country girl and grew up saying it with 3 syllables. 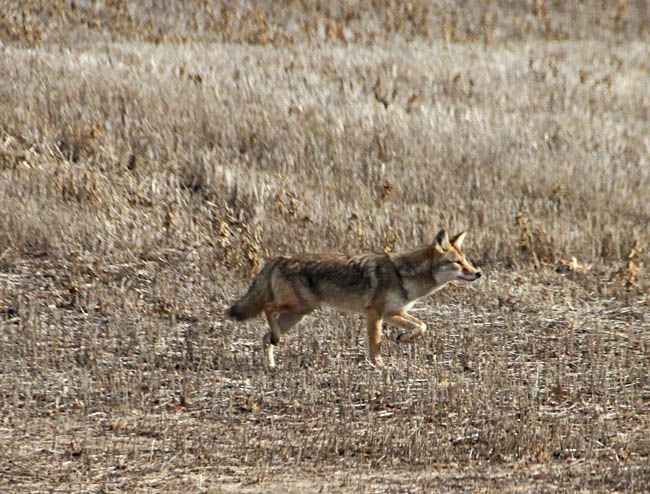 Coyotes were not in upstate SC when I was little, but my parents hear them all the time now. Hope we never run into one while we are walking through the woods! I love that you "shot" it with your camera! I thought you were gonna say you REALLY shot it. That would've been awesome! But, you did snag some great "shots!" I have never thought of myself as a country girl, but I only say it with 2 syllables. Guess I'm not as sophisticated as I thought! Ha! I say it with 2 syllables. Grew up in the country, and live in the country now. We see them out behind our house at our water trough, but they haven't ever come up in the yard yet (that we've seen). Which I'm glad about. Had some friends that the coyotes came right up on their porch and got their cats/kittens to carry them off to eat. I'm always afraid to let my dog out at night when I hear them. She'd go after them and probably wouldn't come back. I usually just take the gun and shoot up in the air to scare them off, but it's because they're always out there at night and I can't see them good enough to try to shoot them. Two syllables. Up here at the University of South Dakota the coyote is our mascot. I was totally expecting a Phineas and Ferb reference here.....because one of the girls always comes over and says, "Hey Phineas, Whatcha doin?" 2 syllables usually. i love to hear them howl. as a child the sounds scared me, but now i like it. a sweet reminder of growing up. it's always a joy when i am at my parents farm and i hear them. gets even sweeter when the pheasants and owls can be heard too. 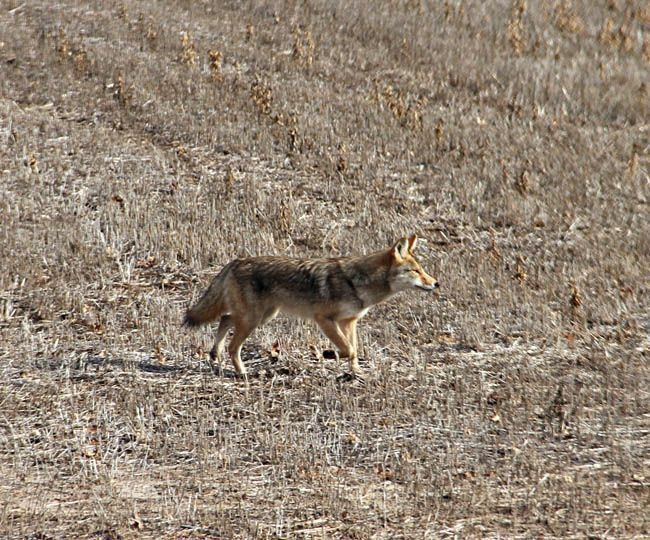 once in awhile we'll see a coyote out and about in the day. usually far enough away to not worry, though. I'm from North Carolina, and I use 3 syllables. But I currently live in Colorado and most people here use 2 syllables, so I think part of it is regional. I grew up a country girl in Florida. We always said it with two syllables. Then, after I got married, I moved away from home and changed the way I said it (to 3 syllables) as I tried to lose the "country" accent. But the funniest thing is how my husband says it! He's an Aussie and he says cOY-oh-tee. With the emphasis on "OY." I had never heard anyone say it like that before, but it's super cute!